Special 2-4 is the fourth level of Special 2 in Super Mario 3D Land. It is based off World 6-5. The player starts off on a snowy platform with a Propeller Box in front of them. The player must then get it and jump onto several platforms. After this is another platform that has a Goomba Tower on it. There is then a narrow platform and then several more platforms with Paragoombas near them. Soon the player will reach an area with another Goomba Tower on it. The player then needs to use the Propeller Box to reach some higher platforms before reaching a Red Ring which will spawn five Red Coins, which if collected them in time give a power-up or a 1-Up Mushroom as a reward, soon after this the player will reach the Checkpoint Flag. 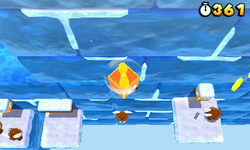 The next area contains several Paragoombas and narrow platforms, the player will then reach two wooden walls where they will need to Wall Jump to reach the top of it and if they decide to go up they can reach an ice platform where they will receive a 1-Up Mushroom if they go near the far left, if they decides not to use the wooden walls they will have to traverse another narrow platform and a Paragoomba. Soon the player will reach two Donut Lifts and will have to jump over a Goomba Tower before jumping up several more platforms before they reach the Goal Pole. Star Medal 1: There is a Brick Block and a Question Block after a thin platform with Coins. Using a Propeller Box to get to a previously impossible area leads to the Star Medal. The player will need to go to the far left of the platform. Star Medal 2: This Star Medal is in a high area close to a Question Block and a tall Goomba Tower. Using the Question Block and the Goomba Tower can get Mario to the Star Medal. Star Medal 3: Near some Donut Lifts, Mario should use a Propeller Box to reach the final Star Medal.